Most of my readers know that I have a beer budget but champagne tastes. I like the best, but cannot afford to buy it off the showroom floor. As a result, I bargain hunt like no other and find great pleasure in being able to find what I like and desire at a price my wallet will support. I have been following the blogs of many Tiny House aficionados and enjoy seeing their successes. I love reading about the adventure of building one of these gems. Most have bought commercial plans to build their homes in some form or another. The plans I most coveted were over $1000, and frankly I feel that is entirely overpriced. I understand this is a niche market, but the seller fails to understand that the majority of tiny home builders have tiny budgets as well and would like to put the money into the physical building. Since building plans are non-transferable, there is no way to "share" and spread the cost out. This is the sole reason I have not yet purchased a set of plans, but have been working on key components that don't require the building plans (i.e. water system, electrical, cabinets, etc.). But today I think my search for plans came to an end. 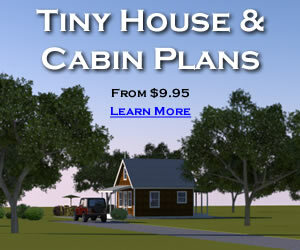 I found Micheal Janzen's Tiny House Plans and found the Coastal Cottage (to see all the plans available click the Tiny House Plans icon on the right hand side or below). The Coastal Cottage is an amazing set of plans because you can modify them to a bunch of different floor plans, based on your personal needs. They are also written for a 28' trailer, but can be modified easily using basic math (yay!) all the way down to a 16' trailer. I adore the seaside cottage look and the front windows had me from go. These plans have not been checked by an architect, so you may wish to have them looked over if that is a concern for you, but if you are like me, you have a ton of different building resources you can look at as well. For just $9.95, I challenge you to find a better deal!